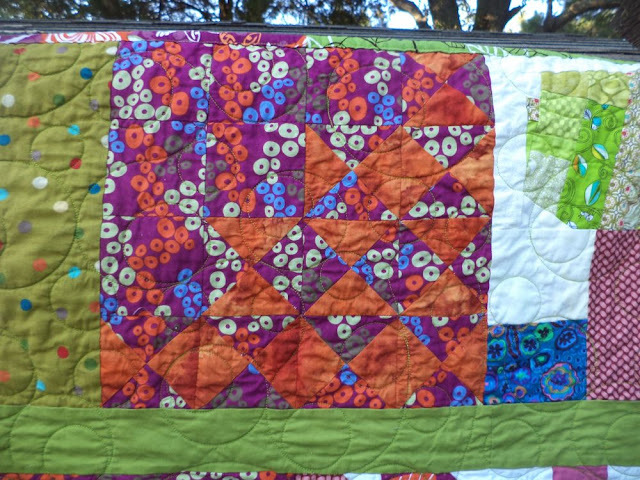 If you've been following along you might remember back in August I posted some blocks that the Tyler Modern Quilt group had given me. These were from a group challenge where they all had to make blocks using a certain fabric, however they all disliked the fabric so much they were eager to give them away. 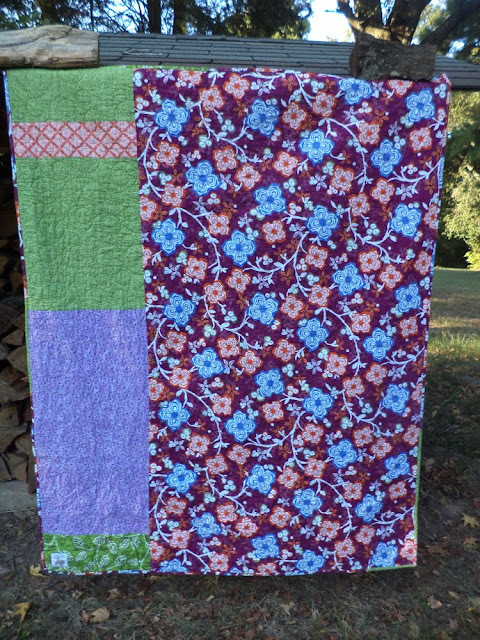 Finally, here's the quilt made from their challenge fabric blocks. Not bad, huh? Orange and purple aren't my colors personally, but I figure everything is somebody's favorite. One of my favorite parts of this quilt are the three applique chenille hearts some one made, so nice and soft! A local long-armer has graciously offered to quilt a few tops for me for Covered in Love. This is the first one she's done and it looks so cool! If you're looking for an affordable long-armer, especially if you're local check out Annie McHugs. 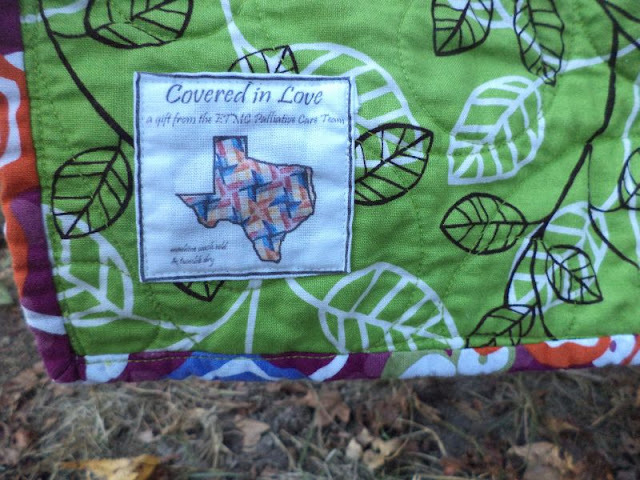 Thanks so much to the Tyler Quilt Group folks and to Annie McHugs for long-arming :) This quilt will be donated to the families of patients who pass away in the hospital through Covered in Love. 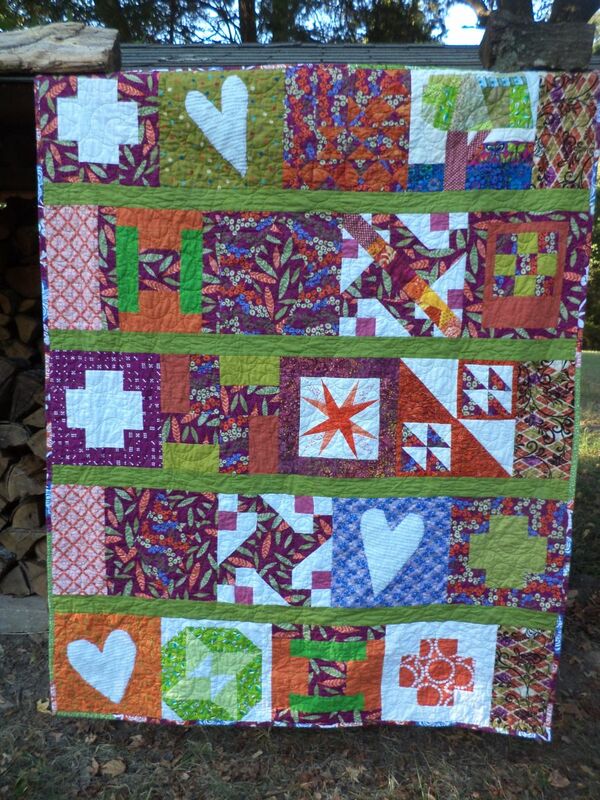 If you would like to contribute blocks, tops, or quilts please check out the main page. We also have a monthly block drive you can contribute to if you're looking for a low key way to participate. What a great way to give orphan blocks a second life! Nice to meet you Kat! 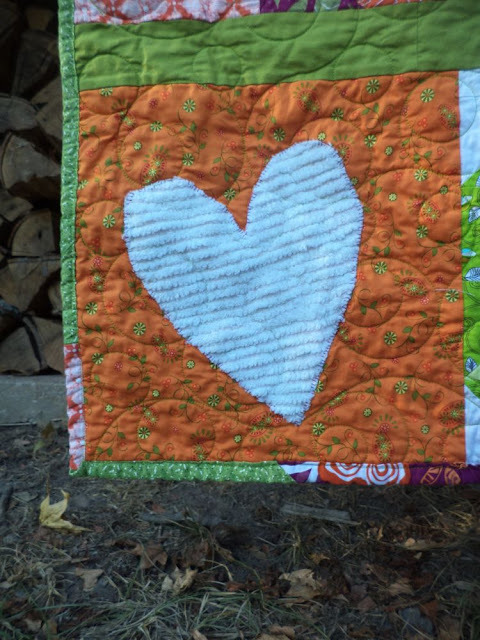 You are certainly prolific with your quilts of love, and they are all so attractive and cozy looking. In case you don't hear it enough, I think what you are doing is wonderful. Did you know you are a no-reply blogger? It's easy to change that by making your email address "visible" in your settings. It won't show anywhere, but changing the setting makes it possible for other bloggers to reply to your comments.